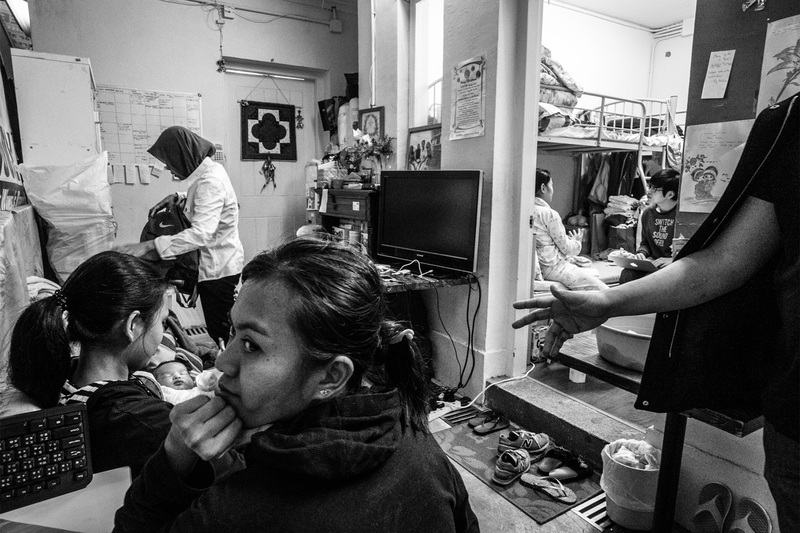 The Bethune House Migrant Women’s Refuge is a temporary shelter that serves distressed foreign domestic workers in Hong Kong. It first opened its doors in 1986 and was established under the Mission for Migrant Workers, an outreach program of St. John’s Cathedral. 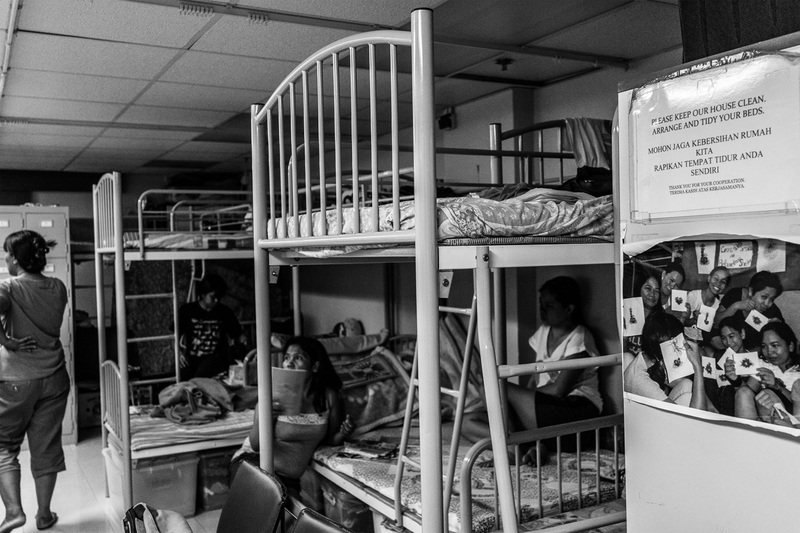 According to the director of Bethune House, Edwina Antonio, since it commenced operation the shelter has served more than 20,000 migrant woman and their children. 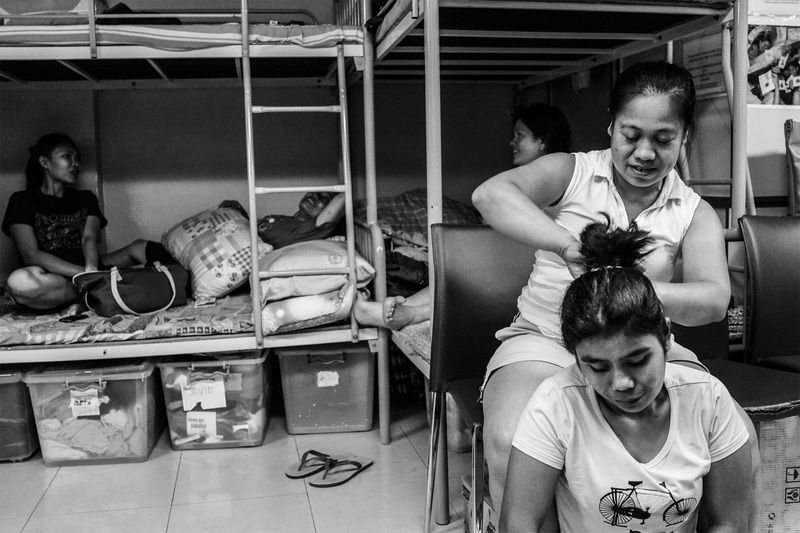 Judy, a caretaker in Bethune House, helps Aniya, an Indonesian domestic worker, fix her hair in the sleeping/common area in the shelter. Aniya says she ran away from her employer after working without pay for more than a year. She says her employer brought her to mainland China to work under terrible living conditions for more than a year. Because she was hired under Hong Kong labor laws, bringing her to the mainland to work was illegal. Aniya cannot read or speak English or Cantonese, and she did not pursue a case against her employer. She says she just wants to go home to Indonesia. Shirley Dalisay and Marisa, residents of Bethune House, catch up on their daily activities. Both women came to Hong Kong from the Philippines. Here, residents support each other emotionally, socially, and sometimes even financially, when they can. 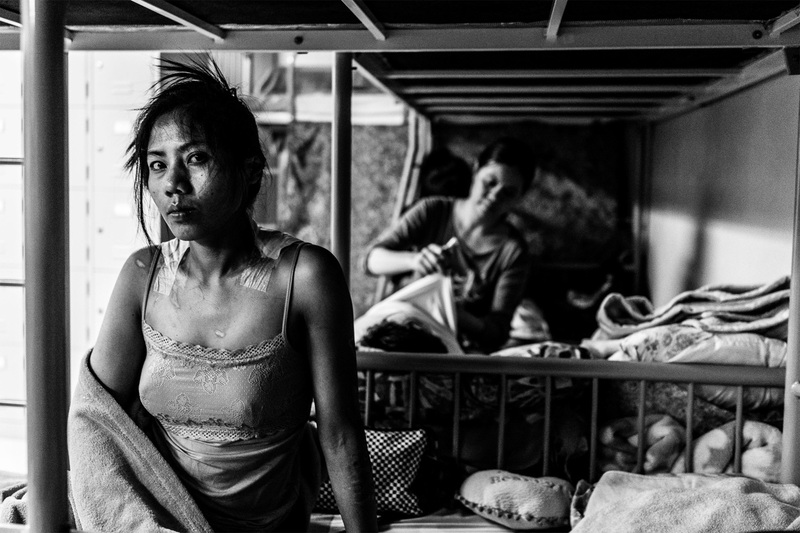 According to Antonio, most of Hong Kong’s approximately 330,000 foreign domestic workers come from the Philippines and Indonesia, half are married, and most are on-call 24 hours a day. 4. 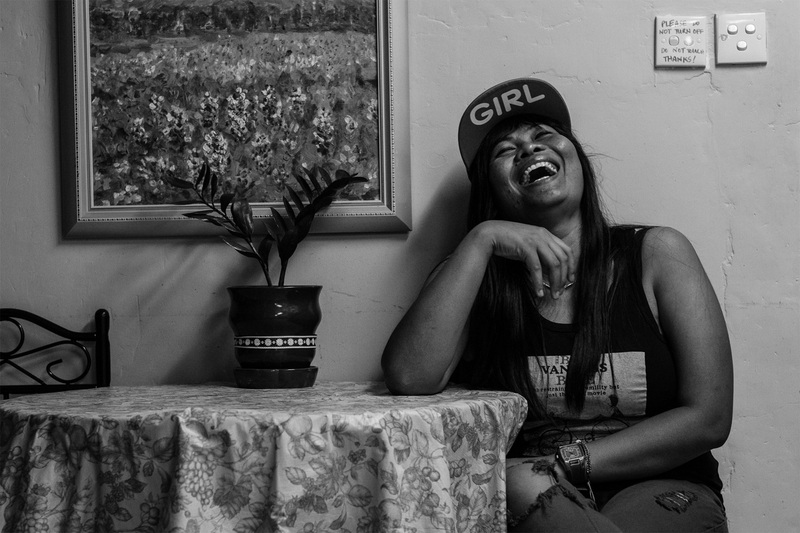 Minarsih, an Indonesian domestic worker, laughs during a Mother’s Day celebration at the shelter. She has a six-year-old son in Indonesia. In 2014, Bethune House accommodated more than 600 migrant woman. 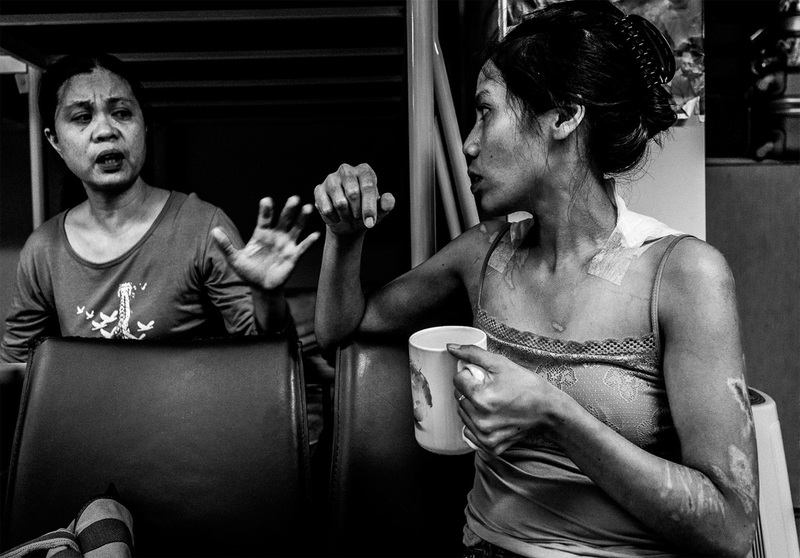 Sunarwi, left, and Kuryati, Indonesian domestic workers, take a break in the back staircase of the shelter. Most Indonesian workers complain that they are underpaid. According to Bethune House staff, Indonesians are paid less than other nationalities, and their income often falls below the minimum allowable wage level set by the Hong Kong government. Shirley Dalisay, 31, from the Philippines, suffered from burns on her back and arms when a pot of boiling hot soup fell on her after her employer “accidentally” put the soup above the family’s shoe rack where Shirley stored her shoes. Dalisay’s treatment required hospitalization, but her former employer refused to take her to see a doctor, didn’t permit her sick leave, and instead terminated their contract, which is against Hong Kong law. She stayed at the shelter for nine months during her recovery. Shelter staff spend time with volunteers and shelter residents learning crafts, skills they can use when they return to society. While a worker’s case is in process, it is illegal for her to work another job, so she has no income. 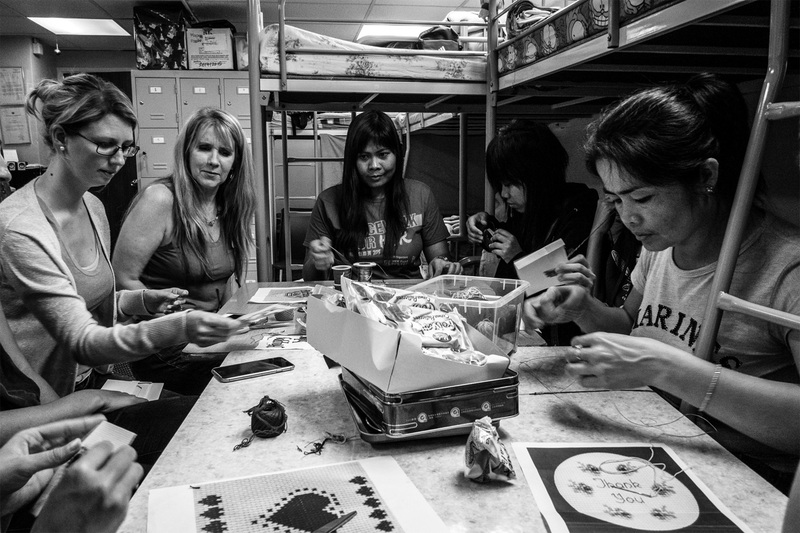 Bethune House is not alone in providing shelter to foreign domestic workers, but in addition the organization provides education, advocacy, counseling, and case support. 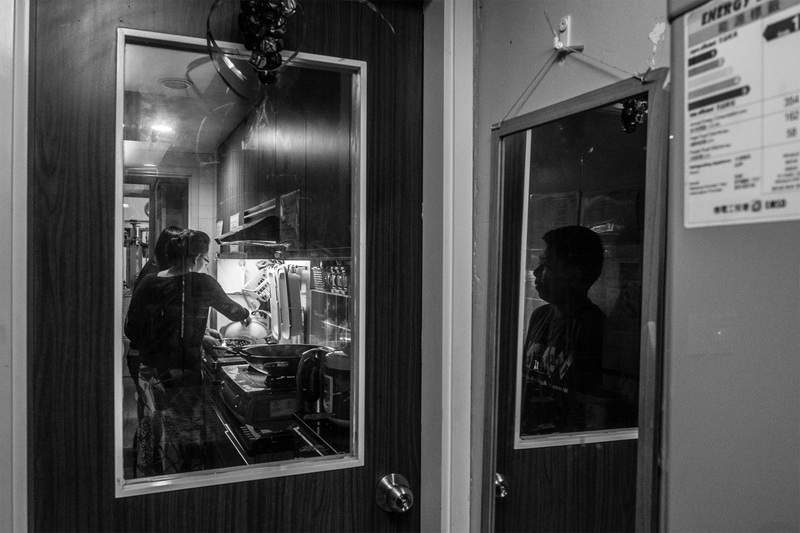 Banjo, a Filipina domestic worker and member of the LGBT community, watches as other residents prepare food for dinner. The shelter does not discriminate. It helps anyone who has problems, regardless of their sexual orientation, country of origin, or faith. Residents are divided into teams to systematize the running of the shelter, and everyone takes turns with daily chores: shopping for groceries, cooking, and cleaning. On this day, one of the teams is cooking for the 21 residents staying at the shelter at the time. The shelter accepts food and monetary donations to supplement a staple menu of fish and rice. A photo of former residents hangs below a sign in both English and Indonesian. Bethune House pledges to provide paralegal counselling, rights awareness, skills training, and psychological and social support for distressed migrant women workers and their families. 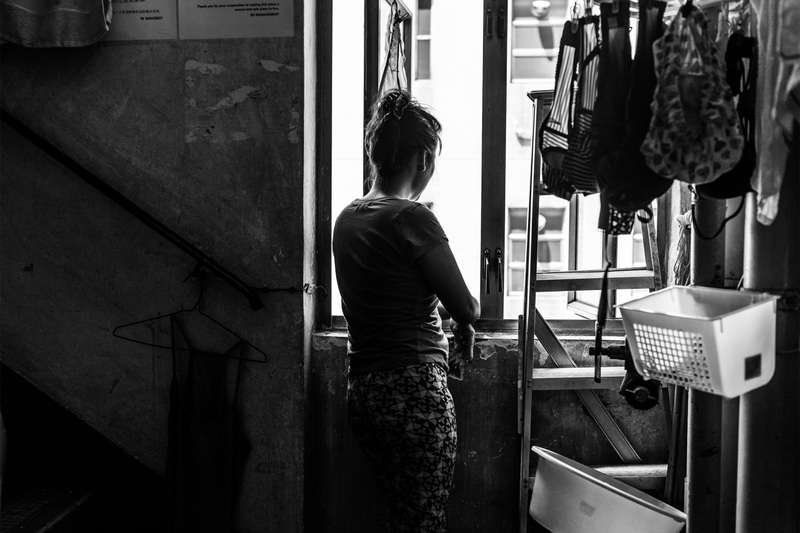 Many foreign domestic workers’ families are back home, and they have no alternative source of economic or emotional support in Hong Kong. A portrait of Bethune Tellez hangs in the shelter. She was the daughter of one of the women who founded Bethune House. In 1986, at the age of nine, Bethune was hit and killed by a taxi cab, and the shelter is named in her memory. After the original shelter opened, the host church reclaimed part of the space it had used, so the shelter opened an additional second location. 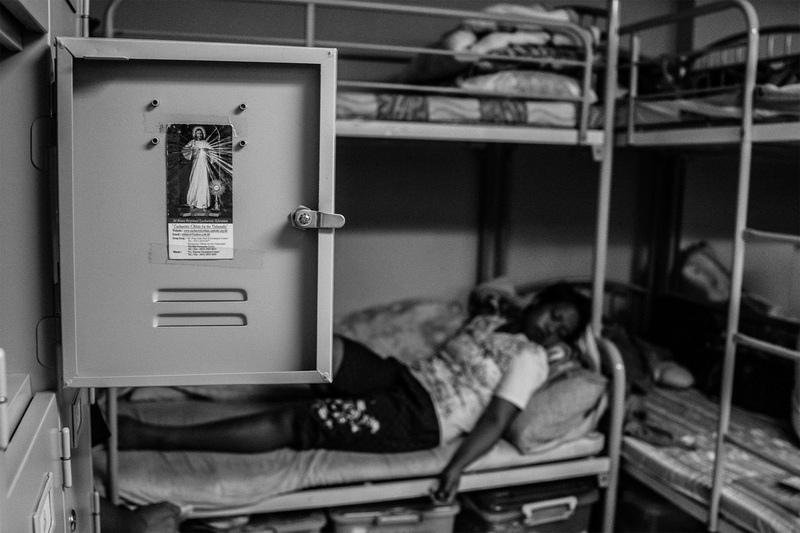 An image of Jesus Christ adorns a resident’s locker as Sunarwi, an Indonesian domestic worker, rests after spending a day in court. She was accused of stealing 150 Canadian dollars from her former employer. Following a trial, a court later found Sunarwi guilty and sentenced her to a three-month prison term. 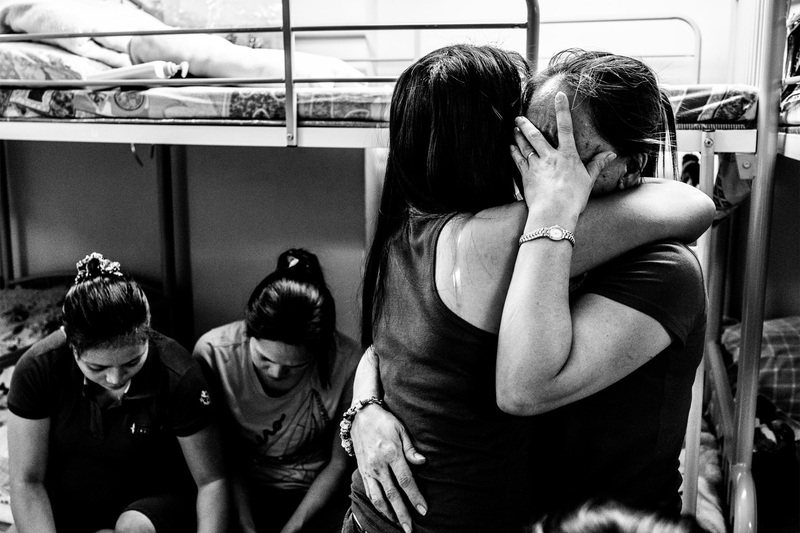 Once foreign domestic workers have been sentenced and served out their jail terms, they are often deported and barred from returning to Hong Kong. The original shelter in Jordan (in the Yau Tsim Mong District) is located in the back of the Kowloon Union Church. 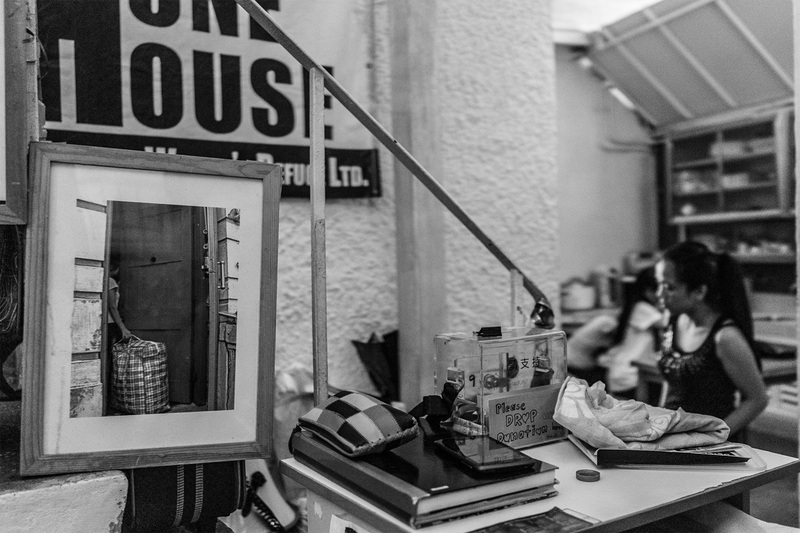 The church later expanded into half of the shelter’s space, so Bethune House opened a second location in 2011 in Sheung Wan, where rents were lower, to accommodate additional domestic workers in need of aid. Shirley calls her husband, Edgar Calwing, on a mobile device. Calwing is a migrant worker in Taiwan. 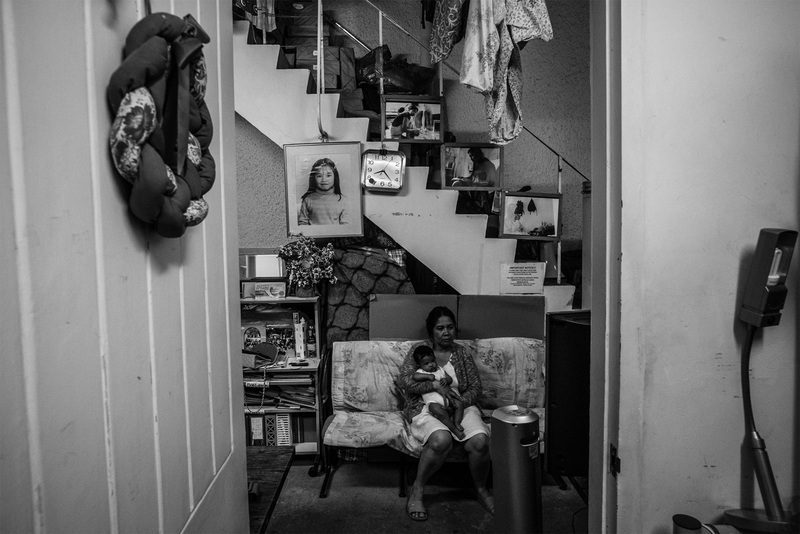 In order to find work, both husband and wife left their native Philippines, leaving their four-year-old child in the care of their parents. It’s not unusual for both parents to leave their children with relatives back home so they can work abroad. 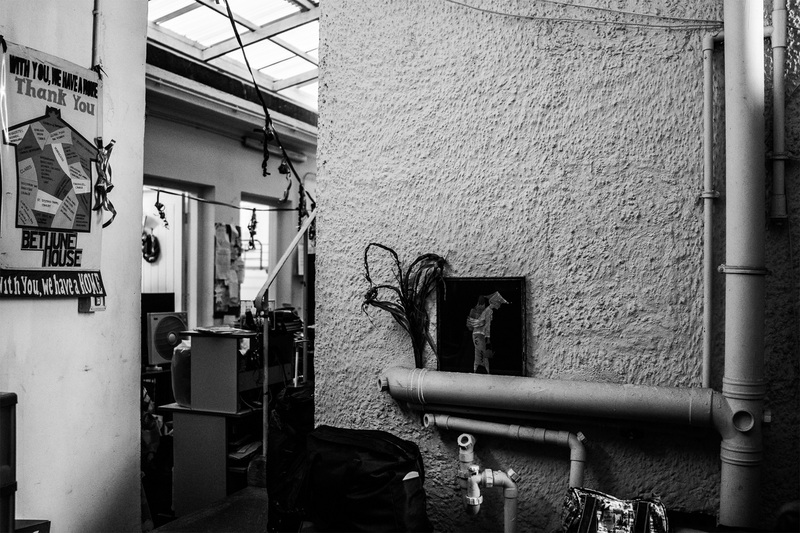 A domestic worker, who requested she not be identified, stands at the back stairway of the shelter. She was fired from her job when she complained about her sleeping situation. She had been made to sleep on the kitchen floor. The shelter is only 900 square feet, and the window in the stairway is one of the only ones in the shelter. The others are in the toilet. 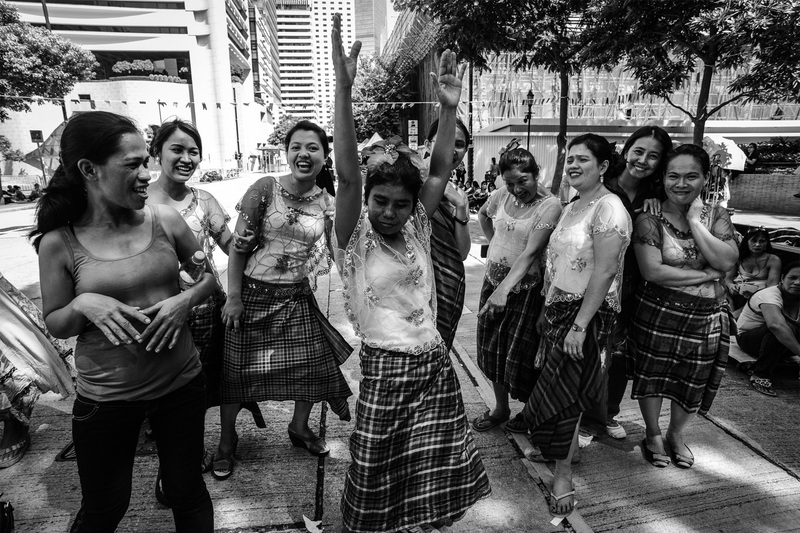 On a Sunday in September, 2014, survivors of domestic workers abuse celebrate the shelter’s anniversary, which is September 21. 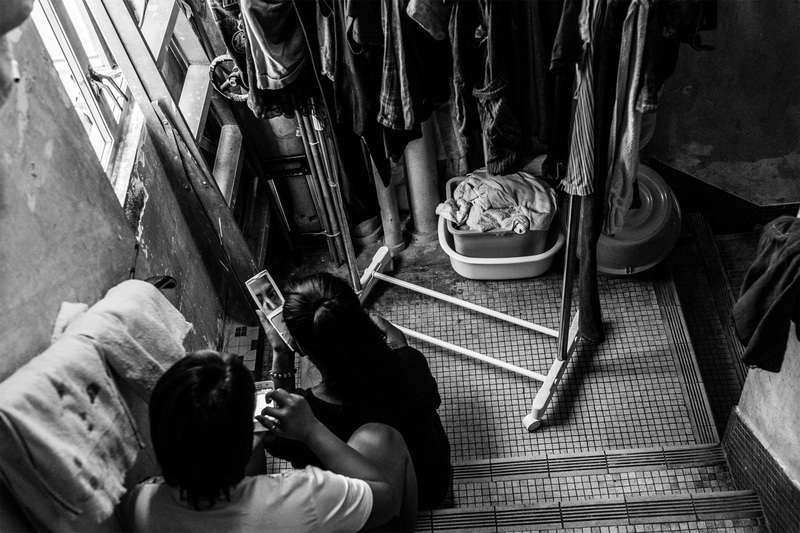 Sunday is a day off for domestic workers in Hong Kong. 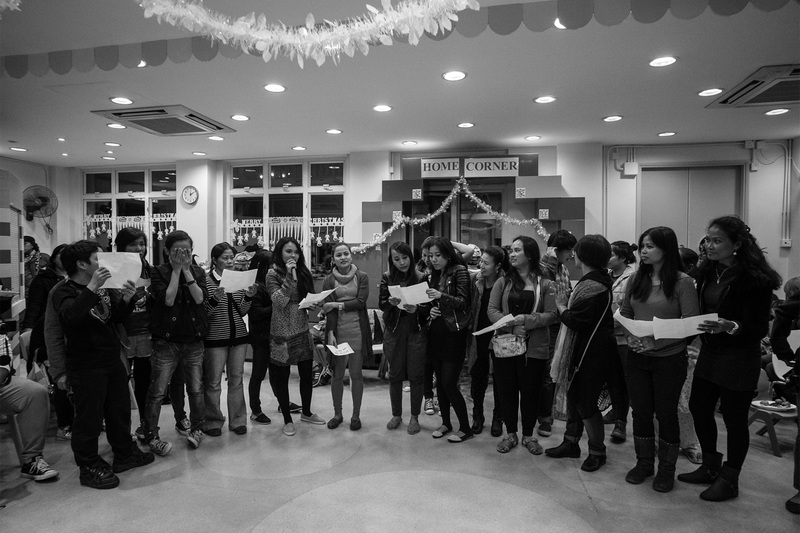 Residents of the shelter celebrated Christmas in 2014 at the Kowloon Union Church. They read their wishes and sang Christmas carols. Many of them said that the festivities helped lift their spirits and made them forget their troubles, if only for a while. The shelter in Sheung Wan is only 900 square feet and has only five bunk beds. The space in Jordan has 6 bunk beds. 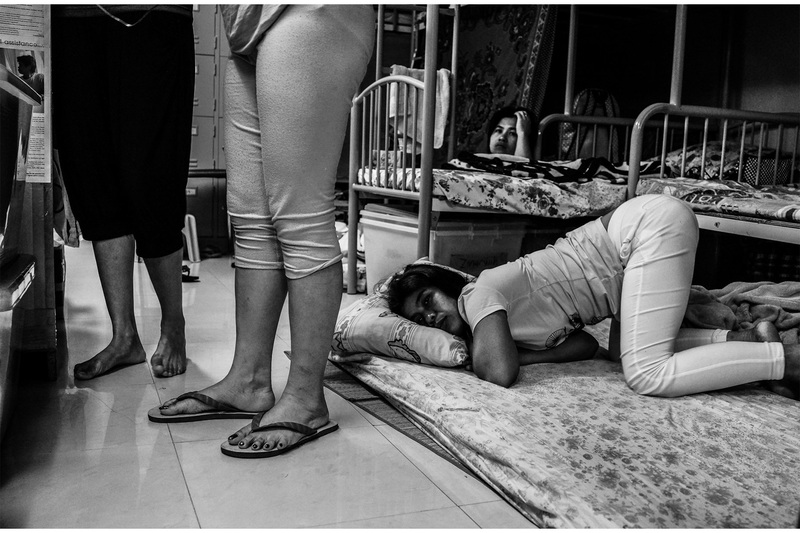 The shelter is often over capacity, since it will not turn away domestic workers in need, so women also sleep in makeshift beds on the floor. At weekly sharing sessions, residents update one another about their court cases and plans for the week. 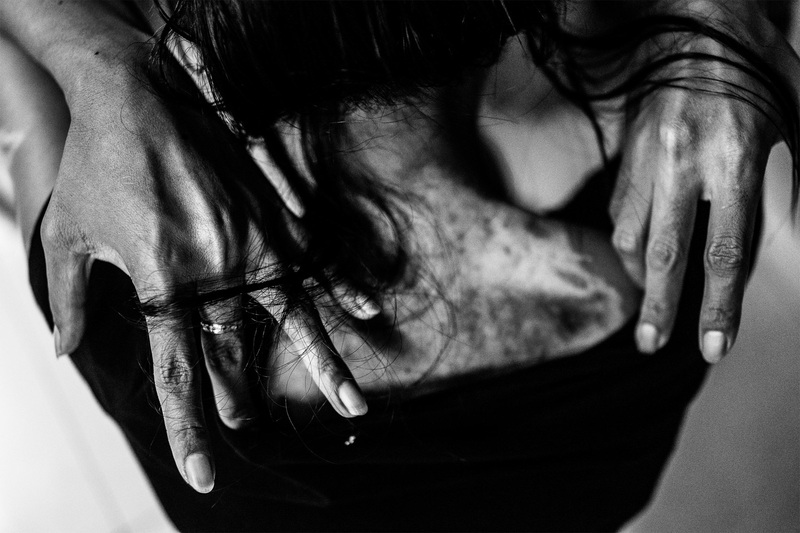 Most domestic worker abuse cases usually last a month, and often end when the domestic worker decides to drop her case and return to her home country. While the cases are pending, the women are not allowed to work, so they have to rely on charities for food, shelter, and emergency needs such as visas, medical expenses, bail money, and transportation to court. Most of the workers in need of temporary shelter have had their contracts unjustly terminated, were sexually or physically abused, underpaid, forced to work under very harsh conditions, or victimized by illegal recruiters. 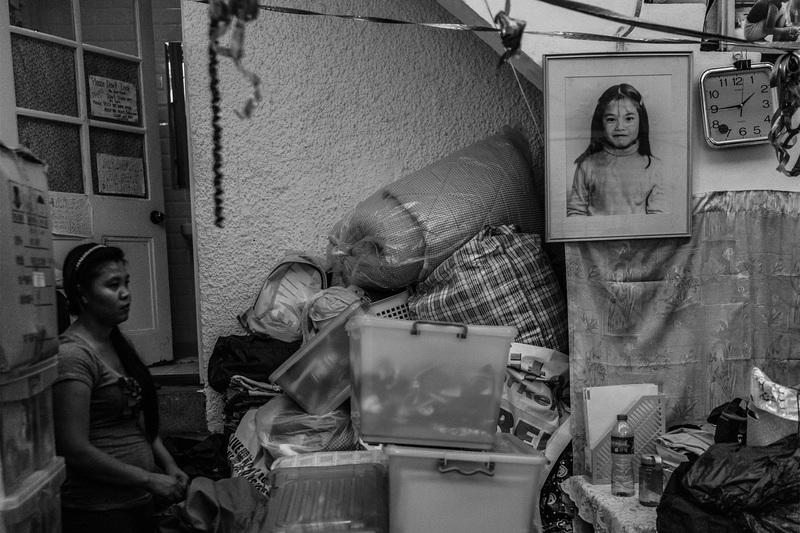 Though many of the women who come to the shelter come as a last resort, the shelter becomes a kind of home. Most of the time, the residents outnumber the bed capacity of 22. The women prefer to sleep on the floor just to have a roof over their heads. 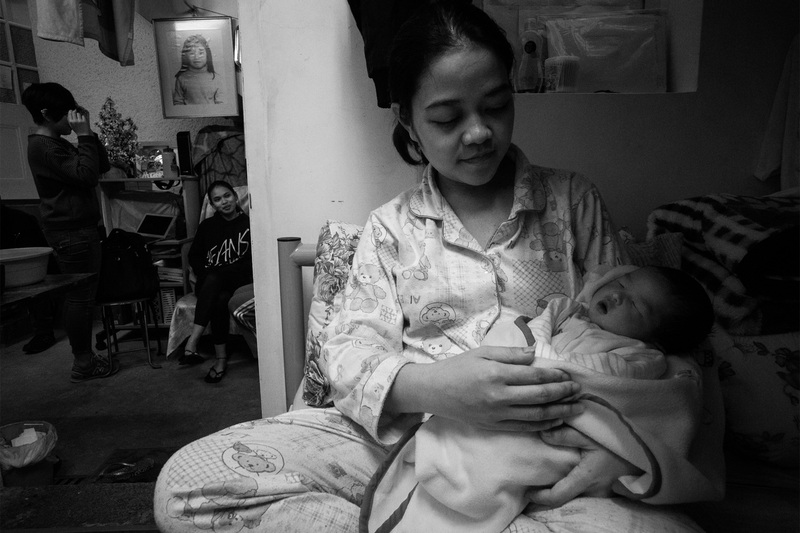 Queenie, a Filipina domestic worker, holds her seven-day-old baby, Yuan. When Queenie learned that she was pregnant, she asked her employer to allow her to return to the Philippines. The next day, the police arrived at her workplace and told her that her employer had accused her of stealing an earring. She was ultimately convicted of that crime and sentenced to imprisonment. Queenie believes her employer wanted to avoid paying her maternity leave. Prison authorities brought her to a hospital to deliver her baby, who was born on January 1, 2015, and since she had served out her sentence she was released from custody a few days later. With nowhere to go, Queenie ended up at the Kowloon Union church, where a minister saw her crying. She was referred to Bethune House for shelter and aid. 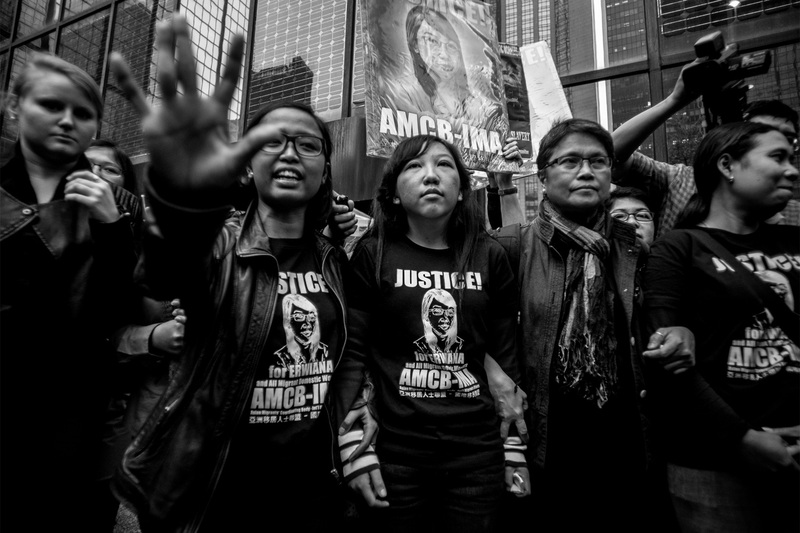 Erwiana Sulistyaningsih, center, leaves the sentencing hearing for Law Wan-tung in Wan Chai, Hong Kong, February 27, 2015. In a lawsuit that received international attention, a judge sentenced Sulistyaningsih’s former employer, Law, to a six-year prison term on eight charges of assault. Found guilty of 18 out of 20 charges, Law was also fined H.K.$15,000, or U.S.$1,930, for failing to pay wages or grant her days off. Law physically, mentally, and psychologically abused Sulistyaningsih for months. She was beaten, underfed, and didn’t receive wages, and her health deteriorated so much so that she was eventually unable to walk. Her employer threatened to hurt her family in Indonesia if she told anyone about the abuse and took her to the airport to send her back to Indonesia. There, another Indonesian traveler noticed her and helped her. 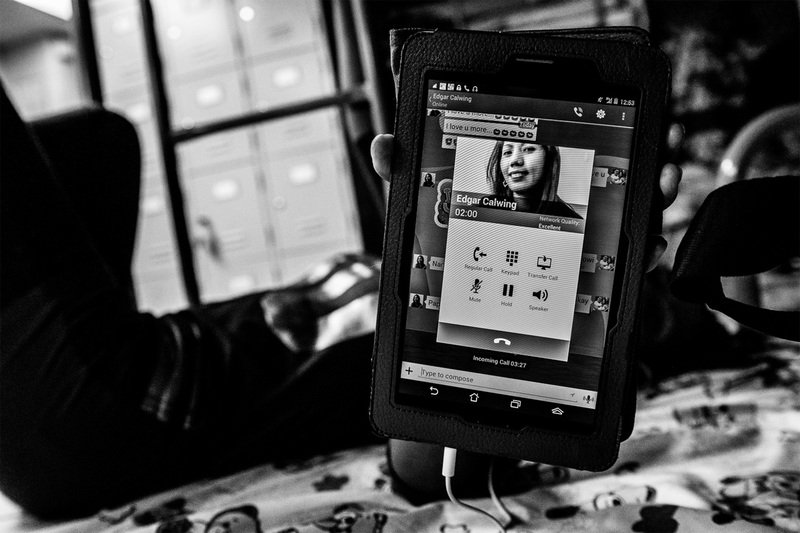 Lilibeth, a domestic worker from the Philippines, looks at an ultrasound image. She was fired when she asked for maternity leave pay, a payment granted by law. In a statement to the police, she said her employer illegally kept her passport and then tore it up so that she could not travel. Gina, a Filipina domestic worker, holds three-month-old Yuan, while the child’s mother, Queenie, is busy working on a case against her former employer to get her unpaid salary. Yuan was born January 1, 2015. He was born two months premature, while his mother was serving a prison sentence for theft. It was at a small, off the record press dinner with a Hong Kong government officer not too long ago at the Summer Palace restaurant in the Shangri-la Hotel. The topic of the day, inevitably, came up for discussion: the minimum wage for domestic helpers had just been raised, to reach the monthly allowance of 4210 Hong Kong dollars, or U.S.$540, a month. “Not a lot, for such an expensive place as this!” someone said. “You must take into account that they have no expenses. They do not need to pay for food nor accommodation: at the end of the day, they are better off than me!” the government officer retorted. The dinner was almost over, and she had already called for the bill. “Which credit card has a discount rate tonight?” she asked, taking out various cards from her wallet. On another occasion, at a large outdoor reception that followed a financial event, on a hotel rooftop, as glasses clinked and name cards flew back and forth, a financial analyst volunteered that he comes to Asia often. His wife is from the Philippines, he said. “Did you marry your maid?” asked an expensively dressed, British-accented Hong Kong businesswoman, with a bright smile. The analyst seemed aghast, but the lady was undeterred: “It happens!” she retorted, holding on to her smile. A superficially stupid comment, a harebrained remark, a look askance on Sundays and public holidays in Central and Causeway Bay, as people walk next to the huge public gatherings of Hong Kong’s “helpers” on their day off: all small marks of the conflicted relationship that Hong Kong has with the foreign domestic workers who have become indispensable to the city’s functioning. Thousands of women sitting in the streets or rehearsing dance routines—sometimes in colorful costumes, as if ready to go on stage, as in Xyza Bacani’s pictures—talking, eating, combing each other’s hair, conducting small business exchanges, exchanging information, painting their nails, packing huge quantities of stuff to send home: to the Philippines, to Indonesia, and further afield. In this territory of nearly 7.5 million people, as of December 2014, live more than 330,000 “foreign domestic helpers” who hail from the Philippines, Indonesia, Thailand, Nepal, and Sri Lanka. They have a minimum wage—but are only allowed to work in Hong Kong on contracts that bar them from gaining full residency, no matter how long they stay. They cannot apply for visas for their spouses or children, since the conditions of employment do not allow them to have “dependents”; should a family member also obtain a Hong Kong work visa, they cannot live as a family, as, by law, a foreign domestic helper must reside with her employer. And even if the rules require that the helpers have “suitable living accommodation with reasonable privacy,” in many cases the dismal size and condition of their actual quarters do not even cause a scandal anymore. Some sleep on mattresses on the floors of kitchen corridors, others in cupboards, some in the bathroom or with the children, others yet under makeshift canopies on tiny balconies. Occasionally, though, a major jolt shakes the whole of Hong Kong out of its distracted stupor over the issue. As happened in the case of Erwiana Sulistyaningsih, 24 (the slight Indonesian woman portrayed by Bacani in photo 22) whose employer, Law Wan-tung, was jailed for six years after beating her unconscious countless times, punching her so hard that her teeth were fractured, depriving her of food, twisting metal tubes from the vacuum cleaner in her mouth, and other violent criminal acts. Law’s lawyer, Graham Harris SC, offered this defense of his client: her acts were not “one of the very worst of its kind [sic].” He recalled the case of Chan Mei-ying, a 51-year-old woman who was jailed for four months for scorching her helper’s hands with a hot iron, after she messed up a blouse. 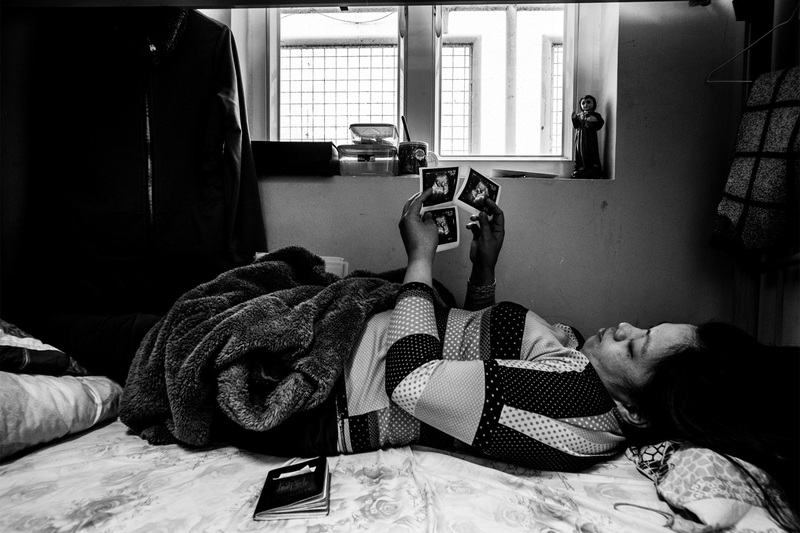 Doubtless also on his mind was the case of Tai Chi-wai and his wife Au Yuk-shan, who are serving a lengthier jail term for attacking their domestic helper with bicycle chains, hot irons, paper cutters, shoes, and hangers. Some may point out that Hong Kong, like much of southern China, has a “different” way of looking at domestic help, given the tradition of “mui tsai”—bond-servants who often belonged to poor branches of a clan, and were given as servants to the wealthiest families. They would serve throughout their lives, in exchange for food and lodging and the promise of being taken care of in old age. The tradition rotted into simple slavery at the turn of the 19th century, but, in some instances, survived in more benevolent forms—Ann Hui depicted one in her moving film A Simple Life (2011). But for today’s women from Southeast Asia, the excuse of a “mui tsai” tradition has little currency: they come to Hong Kong to work to earn enough money to send their children back home to school while they take care of someone else’s children. To keep a roof above the heads of their parents. To look forward to a better future, built by their own hard-working hands. Bacani captures all of this—the hard work, the joy, the resilience, the abuse—and in so doing, she demands that we face a reality from which Hong Kong usually averts its eyes.